This entry was posted in 2011, Birding, Tasmania on November 9, 2011 by admin. Woke up early, as our accommodation is more brightly lit than the the Opera House on NYE, and checked the weather for Maatsukyer Island – it was looking good – not too much wind, but high humidity. Had some breakfast, gathered my gear, and made my way to the airport. To be told that there was a blanket of fog and nothing was happening today. I almost cried, but because I’m tough and stuff, I didn’t. Anyway – had a chat with Greg at Par Avion (I’ll put links in here eventually) and explained my situation – id made this trip basically to see OBPs, and this was the 3rd attempt in 9 days to get in to Melaleuca, but with the weather etc etc, I understood it couldn’t happen. Obviously seeing someone as tough as me on the verge of tears wore him down, because he said that as they were having to get someone out (Ken? From the OBP recovery team) they’d try again when/if the fog lifted, and he’d give me a ring if hat happened. I’d only have about 30 minutes there, but it was the best he could do, although he said there was a fair chance it wouldn’t happen. I jumped at the chance. Anyway – back to Hobart for a coffee, then we headed out to Peter Murrell Reserve to look for 40 Spotted Pardalote – the last bird I need on this trip. We get out of the car, walk down to the lagoon and my phone rings – its on! I drive through Hobart as quick as I could, got there, paid m money (heavily discounted – I wasn’t doing the tour after all) strapped myself in and off we went! I don’t fly very well, but it went much better than I expected. Stuart the pilot was very good, and the flight was generally smooth. Anyway – once at Melaleuca, I headed out to the hide down in the old mine site, and Stuart pointed out a male OBP in a tree – took my record shots, but expecting to see more at the feeding table, I didn’t put as much effort in as I should’ve. (I’ll post the shot when I get back to Sydney in a couple of days). Down at the feeding table, we’re told there’s been 1 around, and low and behold one flies over the top, but doesn’t land. The pilot, volunteer and Recovery team dude all walk back, and I’m given 25 minutes to have a look around. Got some shots of beautiful firetails and dusky robin at the table, and another (or the same) OBP fly over, but not much else shows. Then my times up, an I have to go back to the aircraft. Not too soon either – the clouds were rolling in and the predicted change was starting to make its presence felt. the flight back was a bit bumpier, due to the wind picking up, but I’d got to visit, albeit much, much too briefly, a place not many people have been too, or know exists. Ok, spoke to Par Avion before, and it looks like its game on for a 9am departure!! yeah!! Edit — Melaleuca is fogged in, so no joy. They might be able to take me this arvo, but no guarantee. Werribee is back on the cards. This entry was posted in 2011, Birding, Tasmania on November 8, 2011 by admin. Belting rain at Strahan! Oh noes! Well into the home stretch now, and plans are starting to go awry. Spotlighting last night turned up a solitary Brush-tailed Possum, with no hint of devil, wombat or owl, whether masked or boobook. Then I was going to head out predawn this morning to find ground parrots and emu-wrens at the airport, only to wake up at about 2 am to the gentle pitter patter of a solid stream of rain. It has been getting heavier since then. I do have a black-headed honeyeater serenading me right now – small consolation. We’ll head out to the heads & airport on the way out, and I’ll have a quick, damp look for parrots anyways. Fortunately I’ve seen both birds before, but as the parrots are common here, I was hoping to get that Australian Geographic cover shot of a group of them playing poker or something… Or, you know, just a photo. Ah well. 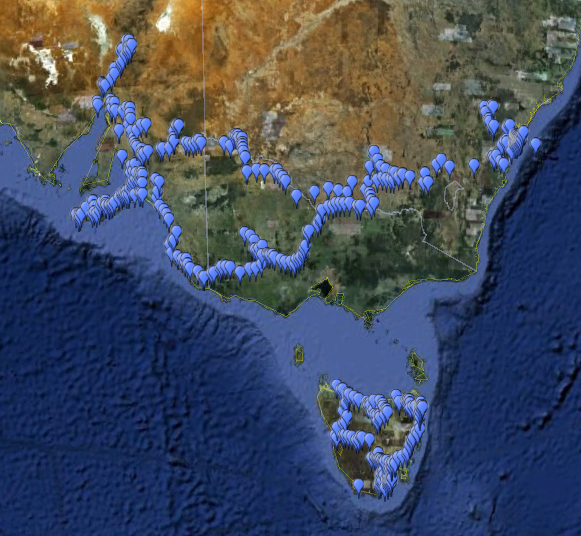 So – who’s up for spending a week at Werribee STW in May/June 2012, looking for OBPs? Craig – can I crash at your place? Last time I wrote, I was hopeful of getting to Melaleuca. That was before we headed up the east coast to the Bay of Fires, across the top, and over to Stanley. Lookin at the synoptic charts, there’s a pair of cold fronts that are looking like hitting Tasmania on Wednesday/Thursday, which were my backup backup days!! Still, I’m ever the optimist and hopefully the fronts won’t get here until Thursday/Friday, and I’ll manage to see an OBP or 16! In other news, I’m now up to about 104 birds for the trip, with the latest being Little Penguin last night. Also at about 10-11 mammals, 1 frog seen, 1 id’ed from call, 1 butterfly and 5 dragon and damselflies. Strangest bird sighting so far is a musk duck (female) getting some “me time” in the ocean, and another one (male) that seemed to spend an inordinate amount of time on its back. Most disappointing sighting would be the 4 common (Indian) mynas seen 11km out of Stanley yesterday – ill be reporting that one to the authorities as there’s work being done to stop them gaining a foothold here. Anyway the Internet is patchy as, so who knows when this will actually get loaded. Today we head down to Strahan, where I’ve got a hot date lined up with Ground Parrots and emu-wrens, and a bit of spotlighting tonight to hopefully find me a devil and/or masked owl. This entry was posted in 2011, Birding, Tasmania on November 6, 2011 by admin. Well, yesterday’s flight got blown out, and it’s looking even worse for today. Just waiting for the phone call. Damn. Will try again for next week, otherwise it’s off to Werribee STW in the middle of winter to freeze to death and hopefully see one there. This entry was posted in 2011, Birding, Tasmania on October 31, 2011 by admin. Hello everyone, it’s been a while! Since I last wrote, I have been on another pelagic, but nothing else interesting. 2 new birds on that trip – white-capped albatross (which I have seen, distantly while sea-watching) and Grey-backed Storm-petrel. Anyway – I’m currently in Tasmania for 2 weeks, with the main reason being to see Orange-bellied Parrot. I was actually meant to be driving to the airport right now. But they called and the flight is postponed until tomorrow due to a cold front. The current wind at Melaleuca according to the BOM is ~60km/h, so I’m kinda glad that it isn’t going ahead today. Instead we’re heading out to Mt Field NP. Anyway , yesterday we swung by Richmond, and I’ve added 2 new birds to my Tasmania list, so it can’t be that bad. I also got shat on by a Blackbird, and although that’s meant to bring you luck, it obviously doesn’t apply to luck with the weather! I’m writing this post on my phone, but I have got my laptop with me, so the next post (probably tonight) will have some pictures, and possibly less typos! This entry was posted in 2011, Birding, Tasmania on October 30, 2011 by admin. Just a quick note to say that bird 507 has been seen and photographed – a party of 12 Australian Painted Snipe at the location posted on the NSW birdline earlier in the week by Matt Weeks. Best start to an Easter long weekend ever! Back in Sydney tomorrow arvo, so more details and pictures then. I’ll also post something to birdline when I get back. This entry was posted in 2011, Birding, NSW on April 22, 2011 by admin.